~”Fusion of subculture and block chain technology”, deliver fighting online game to the world from 2019, The world audition of the Hollywood movie "TO DO & DIE" planned to be released worldwide in 2020! As a management vision for 2019, MINDOL has targeted the market capitalization of within 20th place (55th place as of September 18, 2018) while crypto currencies of more than 2000 stocks are listed. Set ”Fusion of subculture and block chain” as main business, develop an online game with a development budget of 150 million USD. As a first step, develop a fighting game that can be distributed worldwide, utilizing the characters which are applied for the contest sponsored by MINDOL. Strong battles are expected to occur over the world because there is opportunity to get MIN from loser if win the match. In addition, develop MINDOL exclusive wallet that can be used on smart phone, and use it for existing projects such as influencer vote and online game to be developed in the future. Also participating in various movies and making Japanese anime movies as a new media strategy. 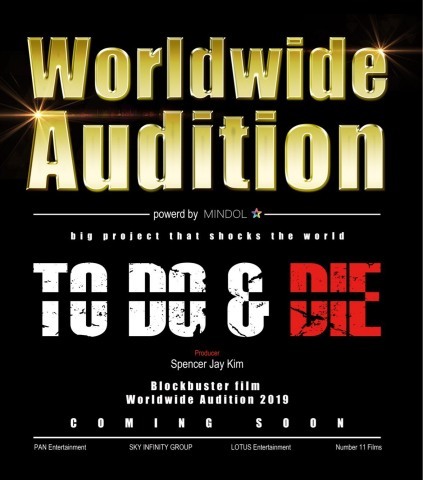 Furthermore, plan to sponsor a Hollywood movie "TO DO & DIE" scheduled to be cranked in 2019 and released worldwide in 2020 and carry out "MINDOL × TO DO & DIE World Audition 2019" from 2019 which can appear on "TO DO & DIE". The performers selected by the audition are planning to shoot in Japan. Details will be released later. PAN Entertainment and SKY INFINITY GROUP take production directing on "TO DO & DIE" and Spencer Jay Kim works as a producer. Sales are handled by LOTUS Entertainment and Number 11 Films, and prepare as a Hollywood movie project with luxury casts and production teams from Japan and Hollywood.